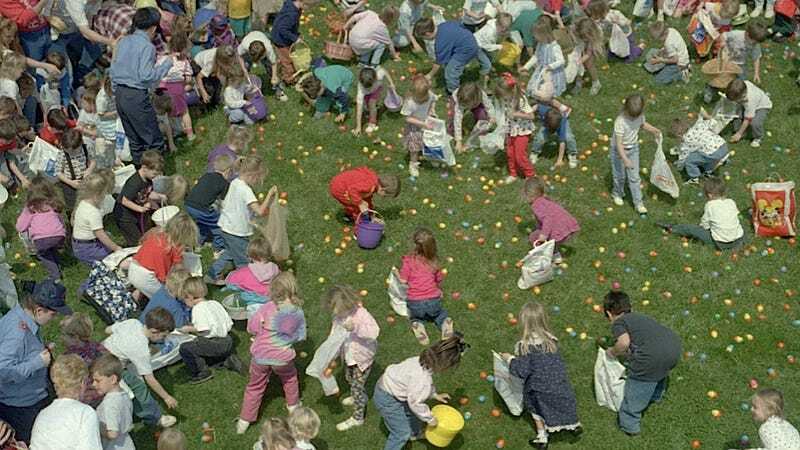 Yet another town's annual Easter egg search party has been called off because parents — the group that Nickelodeon always warned us would ruin kids' fun — in Macon, Georgia are apparently rapacious egg thieves who physically harm anyone who gets between their ugly little children and the smelly Easter eggs whose job it was some town bureaucrat's to paint with watercolors and hide at night in the park (the eggs are probably the plastic variety, but somehow it's sadder to imagine a hungry public servant putting a Hershey kiss in each egg while his or her spouse waits all alone at a table set for two). Bibb County Commissioner Joe Allen, founder of the organization that helps flaunt America's bounty of food by literally throwing away lots of it in a strange scavenger hunt ritual, told the Macon Telegraph that one of the largest Easter egg hunts in Middle Georgia (golly!) has been cancelled this year because "parents caused a situation in which some children got hurt." Parents, said Allen, became violent in their struggle to help gather as many eggs as they could for own kids, and when people get hurt, "they want some kind of compensation." Just when you thought De Tocqueville might have been exaggerating the American citizen's litigiousness, boom, a fresh example arrives just in time to ruin another holiday. Never mind the fact that, according to Allen, "an Easter egg hunt is only part of what Easter is all about" — Easter's really about putting on a really good show for the Lord. In pastels.